Now the new 3G iPhone is out, what to do what to do?! A lot of the reason I love my iPhone is because of the jailbreak & all the awesome apps but unless I'm home my iPhone is so slloooowwww on Edge. So I told myself I would wait to get 3G until a jailbreak is available for the 2.0 firmware. Saturday night the dev team put out the "Pwnage Tool" which will jailbreak the new 2.0 software-- so to check out the tool we upgraded my 1st generation iPhone 1.1.3 firmware to the 2.0 firmware and if I didn't like it we would just hack it again to run on the 1.1.4 firmware so I can get back installer. 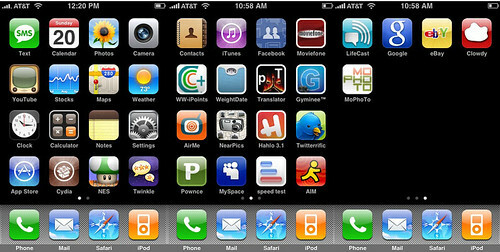 My iPhone 2.0 is jailboken but installer hasn't been ported yet so it makes it kind of pointless to have a jailbroken 2.0 iPhone. I'd have to say I do like the App Store & a couple of the new features on 2.0. My favorite is the Push email thru "Microsoft Exchange". I really like that when I get an email I get it right away (like a blackberry)...before it would kill the battery faster when my iPhone checks with servers every 15 or 30 minutes (depending on the setting) all day to see if you have an email so Push email is awesome. Another fav is saving an image from a website to my photos. I'm a flickr.com freak & if I want to copy a picture from my Flickr to email it to someone I can. I also like being able to delete multiple emails at once instead of 1 by 1. The App Store has a bunch of cool apps & I've installed a bunch of the free apps to check them out (not all are App Store apps, about 6 are web clips). Last night I decided I'm going to get the 3G. I woke up at 5am & went downtown to the 5th Ave Apple Store so when they started selling them at 7am I would be there. The website said they had the white 16gig last night so I figured there would be a chance they would have an 8gig in the morning....not! This lovely sign sign said "Sorry, no 3G available today". But these iPhone fans did not care, a line was forming anyway. I do want the phone & would have waited if I knew I would get one within an hour or so, but I'm not gonna wait hours not knowing if they will even get them today. I called a few At&t stores & they are only taking orders that can take up to 21 days. 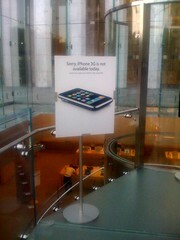 As of now I will just keep calling the Apple Stores & hope they will get stock soon.